Kardamena is a modern tourist resort, at a distance of 29 kilometers southwest of Kos town counting around 1800 permanent residents. Houses and other constructions have been built along the beach and the surrounding area is very beautiful, full of cultivations, trees and green. The natural environment attracts many visitors to the place and the small port part of this town connects Kos to Nisiros. In Kardamena you can admire the old restored building that today houses a Rural Medical Office and see the churches of Agia Varvara, Agion Anargiron and Panagia. Kardamena is built on the area of the ancient city of Alasarna, which used to be an important ritual centre during the Classical Period. The ruins brought to light from archaeological excavations include a sanctuary dedicated to Apollo and Hercules, a marble temple dating back to the 3rd century B.C., a theatre, some Roman constructions and the ruins of a Christian basilica temple dedicated to Agia Theotita (Saint Divinity). The area offers many accommodation alternatives and good food at the numerous fish-house taverns, traditional taverns and restaurants with Greek and European cuisine. Swimming, sunbathing and water sports take place on Kardamena’s long sandy beach. There is also an excursion boat, departing daily to Agia Irini, known for its thermal springs and its therapeutic waters that are appropriate also for gynecological related issues. Every summer in Kardamena the “Alasarnia” festival takes place, including many cultural events, theatrical shows, concerts, visual art exhibitions, traditional dances, scientific conferences and speeches, several competitions (cycling, chess etc) and the nautical week.In Kardamena they honour Agio Ioanni (St. John) on the 29th of August and Theotoko on the 8th of September with many festivities. Any medical issues can be taken care of at the local Medical Centre and a drugstore is available in the village. 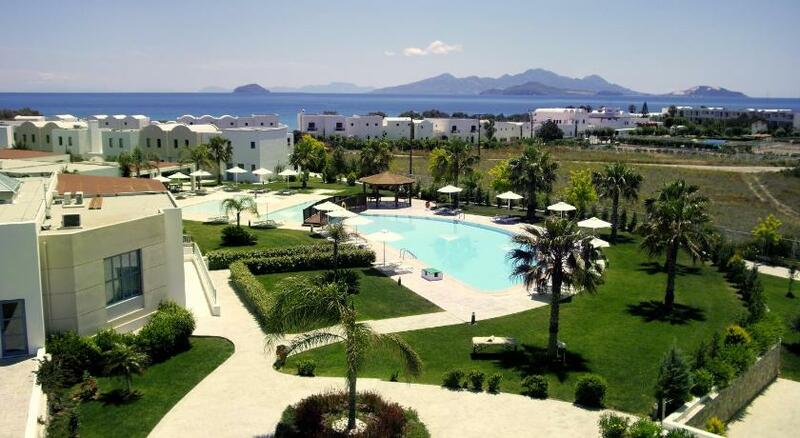 Access from Kos town (29 kilometers) is easy by public buses, by taxi, by car and motorbike. Taxis are available also from the village and, as Kardamena is in the middle of the village, they will take you everywhere. If you have a yacht, the port of Kardamena is suitable both for mooring and water and fuel supply.